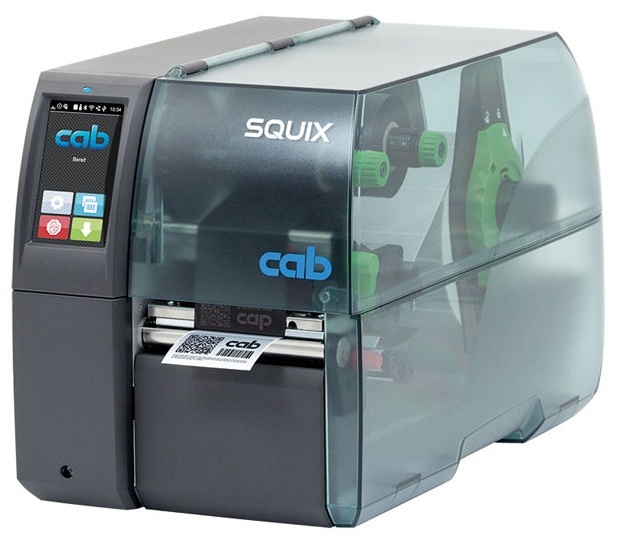 The cab SQUIX4M label printers are the further development of A4+M. The professional SQUIX label printers fit with a wide range of industrial applications. They have been developed with focus on easy and convenient operation and high reliability. The accurate and versatile one for printing on all materials that are wound on rolls or reels or fanfold - especially very small labels or slim continuous materials such as pressed shrink tubes. 1 Ribbon holder - Easy insertion of the ribbons is enabled with the three-part tightening axles. A preprinted ruler simplifies the adjustment. 2 Roll holder - When setting the margin stop, the material roll is automatically centered. If rolls with 100 mm core diameter are processed, an adapter is recommended. 3 Plungers - Both plungers are fixed for all material widths. No print head settings or adjustments are necessary. 4 Material guide - The material guide just in front of the print roller provides accurate imprint. The material width is adjusted with a spindle. To achieve accurate imprint with slim materials and ribbons slim print rollers are needed. These prevent from print roller wear, print head contamination and errors during material feed. Slim print rollers - To achieve accurate imprint with slim materials and ribbons slim print rollers are needed. These prevent from print roller wear, print head contamination and errors during material feed.